I love the idea of onion rings - a crispy batter surrounding a ring of sweet onion. But the things you get from most takeaways are usually disappointly artificial. You have to wonder how much onion they waste to get every ring the exact same size! Ordinary vegetable oil is fine for this recipe. You'll need enough oil in a deep-fat fryer or large pan to cook the rings without them touching the bottom of the vessel. It needs to be heated to 180°C (356°F). Mix all the dry ingredients together, then add the beer. Be careful not to add too much. Your batter should be like thick paint - not too runny and not too stiff. Top and tail the onion, then cut a line through the skin from top to bottom. Peel the skin off, then cut the onion into slices about a centimetre wide - just under half an inch. Push out the central core of each slice and set it aside to use in something else. Separate the onion layers into individual rings. Dip each ring into batter and lower it into the hot fat with a fork. You may need to cook your onion rings in batches, and they'll take about 2-3 minutes. When done, drain them on kitchen paper and serve. The video above is from the Keef Cooks YouTube channel. 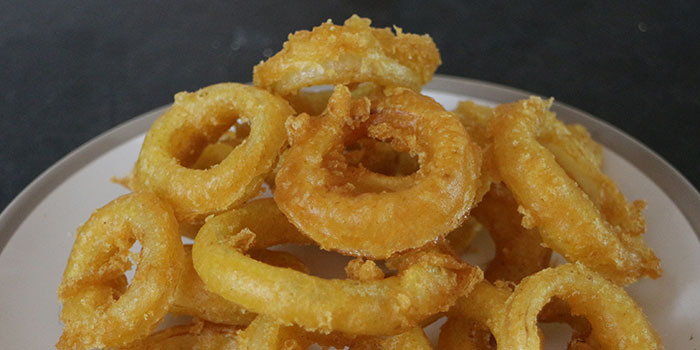 Click here to see the video recipe of Onion Rings on YouTube. Oil for frying. You can use any kind of beer you like, or any carbonated liquid as long as it's not sweet.